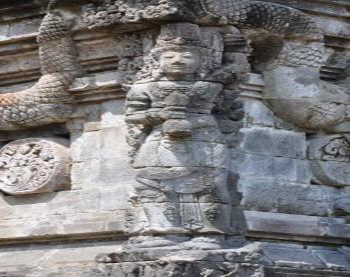 The Nāga temple is situated at the temple complex of Candi Panataran in Blitar, East-Java. The Panataran temple complex is built in the 14th century during the reign of Majapahit (Kinney 2003:179). 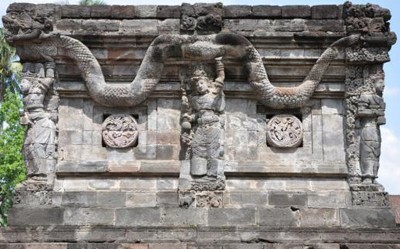 The square building is wired by four tall nāgas (mythological serpents) wrapped around the temple building. The nāgas are held up high by nine figures; the figures on the left and right side of the entrance gate are each holding a nāga’s tail in their right hand while holding a priest’s bell in their left; the remaining seven figures stand straight, while holding the nāga’s body in their left arm and a priest’s bell in their right. All nine figures are richly decorated with jewelry and head garment. Indeed, the bells, jewelry and garment suggest that these figures are really priests (Kinney 2003:26 and 207). In fact, the priest’s bells are still used among priests – padandas – in Bali today (Pannenborch-Stutterheim 1947: 261). The seven figures holding the priest’s bell in their right hand refer to the Balinese sungguhu ritual, whereas the depiction of the two other priests, whom are holding the bell in their left hand, is in accordance with the Balinese padandas’ custom; during the ritual for making holy water the padanda holds in his left hand a bell which he then jingles three times. The jingling, however, lasts for the entire duration of the ritual, thereby allowing the padanda to become one with Śiva (De Kat Angelino 1922: 39). The ritual for making holy water can also be interpretated as an imitation of the story of the churning of the milky ocean. A large number of priest’s bells dating from the Majapahit era have been found in East-Java, which suggests that the ritual (for making holy water) performed by the Majapahit priests of the time still is performed by the Balinese padandas today. Thus, considering the fact that the story of the churning of the milky ocean is the central theme of the two literary texts – the Tantu Panggelaran and the Ādiparva – of the Majapahit Period, it is very likely that the Nāga temple represents the sacred Mount Mahāmeru – the container of the amṛta. The practical purpose of the Nāga temple, then, served as a storage room for this holy water (Kinney 2003: 26). De Kat Angelino, 1922: ‘Balineesche Moedra’s’. ’s Gravenhage: Adi-Poestaka. 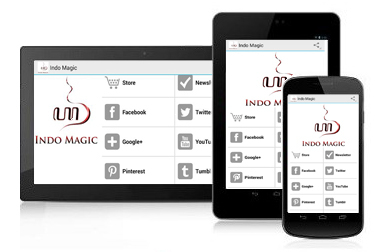 Kinney, Ann & Klieven, Lydia, 2003: ‘Worshiping Siva and Buddha – The Temple Art of East-Java’. Honolulu: University of Hawai’i Press. Pannenborch – Stutterheim, Louise J.F.M, 1926, Treasures or Meditation?, in: India Antiqua. E.J.Brill: Leiden; pp. 257 – 263.